In order for fruits and seeds to form, a flower has to be fertilized with pollen from another flower of the same species. Some plants are self-pollinating, but most require help getting that yellow powder from one flower to another - and that is where the bees come in. As they visit flowers in search of food, they carry pollen with them and leave some behind at every stop. Unfortunately, the bee population has been declining rapidly in recent years, and it isn't clear why their colonies have been collapsing. Some possibilities are: parasite infections, exposure to pesticides, and loss of habitat due to over-development and intensive agriculture. Home gardeners can help reverse this trend by adding plants that provide food and habitat for bees. Choose flowers that are flat and have single rows of petals. These make it easy for bees to get to the nectar they are looking for. Bees like blue, purple and yellow, so keep that in mind when you add flowering plants. 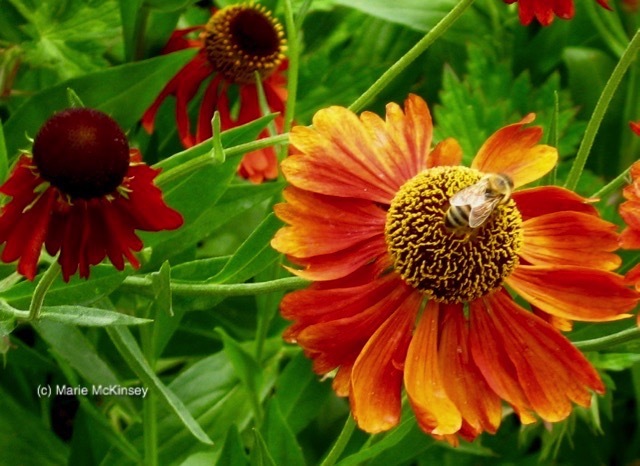 Different varieties of bees are active at different times of the year, so try to have something in flower in your garden from early spring into fall in order to provide food for all of them. Leave a bit of brush, dry grass or dead wood in a protected corner of the garden to provide a nesting area. 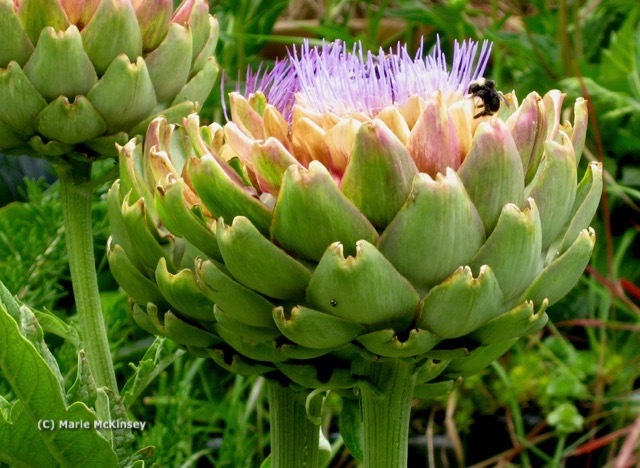 Here's a bee foraging for artichoke nectar.